If you haven’t checked out the spot quoting tool we rolled out back in August there’s still time. We have streamlined the process of sending out quote requests for full truckload and volume less-than-truckload shipments, in true Freightview fashion. Since we’ve rolled it out, we’ve been listening to customer feedback in regards to what we can do to make this tool even better. One thing we kept hearing was the need to have different distribution lists within Freightview. Many of our spot quote users have specific carrier contacts they will send a quote to depending on the location, equipment type needed, etc. We now allow you to have these separate lists within Freightview. To create a new list, click on your name in the top right hand corner, the slider brings out your account settings, and click on Spot quote contacts." From here you can create as many customizable groups as you may need. You can always make changes when necessary. We will keep a master list of all of your contacts as well. 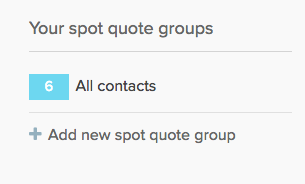 Once you’ve created your different distribution groups you can start using them for spot quoting. 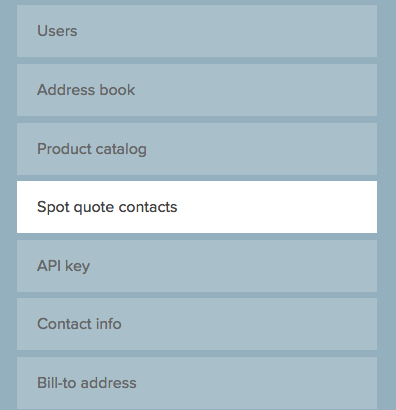 You’ll go through the process the exact same way you have been -- but now you’ll see a new drop down box for contacts. Choose the distribution list appropriate for your particular quote and keep on truckin’. If you aren’t using our spot quoting tool yet, and are interested in a demo, schedule a time with Mitch to learn how Freightview can now help you streamline more than just your negotiated LTL rates. See all Freightview has to offer, and sign up for a free trial today.